Hakuin Masamune, Takasago, Eikun, Shosetsu, Garyuubai, Chuumasa, Haginishiki, Masuichi, Hatsukame, Isojiman, Suginishiki, Kikuyoi, Shisaizumi, Wakatake, Sayogoromo (which I visited in his company!) & Han no Mai! Almost half of the Shizuoka Breweries represented! 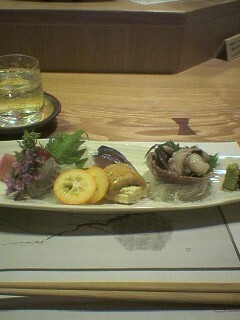 Masuichi, Isojiman, Kikuyoi and Kokko. And then I was off outside in the night…. He had a bottle by Okinabenten, which ceased brewing in 2006. Unfortunately He had only the 1,8 l bottles left. I had to get satisfied with a pic and some notes. But he also had bottle brewed by Hasshou which used to be in Hamana Gun, now part of Hamamatsu City. I had a good day again drinking history! (Fuuki is on top shelf, middle between haginishiki & Hana No Mai. When did sake brewed in Shizuoka Prefecture finally come to the fore in Japan? As far as as 1972! Incidentally, Shizuoka Prefecture got 12 nominations between 1972 and 2005, Ishikawa Prefecture 18, Toyama Prefecture 5, Shiga Prefecture 1, and Kyoto Fu 1! Between 1995 and 2005, Shizuoka Prefecture got 6, Ishikawa Prefecture 4 and Kyoto Fu 1! I met Mr. Takhiro Nagashima, onwer of Nagashima Liquor Shop in Shizuoka City and Mr. Ryuuji Mayuzumi, a hygienist at a local hospital who is also a certifed taster, at 1306 at Shizuoka Station. 40 minutes later, we got off at Kikugawa City Station. Kojyo for Hamasaku Liquor Shop in Hamamatsu City and Aeru No Sato for liquor shops in Kikugawa City. May old sake breweries have a “ball” hung under the eaves or roof at their entarnce. It is made of ceadr branches. Have you ever wondered about it purpose? Actually it is a kind of “timer”: the cedar will dry and change colour and give the brewers indications not only time elapesd but also on climatic conditions! Similarly, in England old pubs and beer breweries hung a bush under their eaves for the same purpose. On a similar note, winegrowers in the Bordeaux area still plant roses at the end of each vine row to check the weather and especially the event of mould forming! Shizuoka Sake for St. Valentine? With Saint Valentine around the corner, some Shizuoka Brewers have come up with a new way to entice customers to buy their products: personalized bottles. Bottles vary from 300ml and less to 720ml. They all contain some kind of message on their labels, some very direct, such as “Gambatte!”, Arigatou”, etc. I was surprised to notice upon inspection that the sake offered was of a high quality for such a mass sale oriented seasonal product! Sake as a beauty product? I would not be surprised to hear newly-come foreign women snigger at the notion! Actually sake has been used by Japanese women (that is the richer ones) in their bath for centuries. 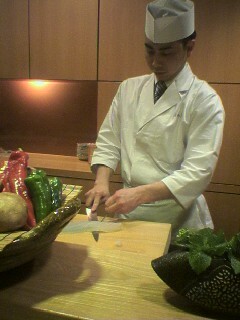 Incidentally, shochu is also used in such a manner in other regions. Alright, now what sake should we use? Any will be fine actually, but it could mean an extravagant manner to savour it! I get lots of sake presents, especially in the form of one-cup sake. Instead of discarding it as the quality is sometimes suspect, I pour it in my morning bath, for which my wife is thankful as it leaves a soft sheen on the skine, even after toweling. There is practically no smell left, and there is little danfer to get accidentally drunk as the alcohol will quickly dissipate in a hot bath! Try it (ladies and gents alike) and you will thank me!